Cycling down the stunning coastline of southern Vietnam past turquoise bays, white beaches and palm tree-lined rice fields. Explore the majestic Royal Tombs of Hue and ascend the Hai Van Cloud Pass for vast views of tropical mountains falling into the sea. Pick up from airport and transfer to hotel. 8 .30 am: Meet at Hotel, guide of cruise company pick up you in hotel . Drive to Halong City (3.5 hrs) thru the Red River Delta with its verdant farmland dotted with local villages. A t sunrise, enjoy Taichi exercise yourself. International breakfast is served while cruising to the other areas of Bai Tu Long Bay. Embark a bamboo sampan rowed by a local girl to explore the fascinating floating fishing village . We will visit local houses, fish farms, and schools or kayak through water tunnels in to hidden lagoons to see unique sea creatures and colorful coral reefs. Back on boat of traditional junk, gourmet lunch will be served whilst the Cruiser keeps on its route through the Bay back to Halong City. Check out after 11:30 before returning to the Jetty for transfer to the private coach back to Hanoi. Arrival Hue in the morning transfer to Hotel, and lunch in Hue local restaurant, Afternoon cycling through Hue’s King Royal Palace, a succession of Nguyen Dynasty . Afternoon cycling to country side until 5PM transfer back to city. Dinner in garden house. Day 6 Hue to Hoi An (+- 60km asphalt road ) . Cycling in back road of country side from Hue to VinhHai beach ( +-70 km flat asphalt road ) . Optional climb: Hai van pass: 19 km ( 9km up, 10 km down, altitude +- 400m ). Our route passes by rural villages and picturesque Lang Co lagoon, an ascent of the pass with stunning views of the coast and a thrilling 5-mile descent from the top of the green rice fields around DaNang. End of cycling in DaNang city, drive 32 km to HoiAn. Cycling tour of HoiAn – country side villages in the morning for Vietnamese cooking lessons in town featuring local specialties by one of VietNam’s most talented chefs . Local food in cooking house in HoiAn. Cycling in the back road of past rural rice villages canopied by swaying coconut palm. Arrive at the Quy Nhon town which faces a beautiful beach front. 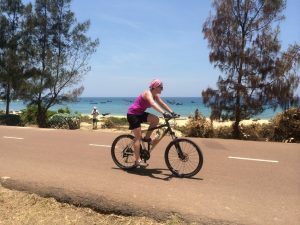 Back road cycling in side high way one .Our ride from QuyNhon to Tuy Hoa covers some of VietNam’s scenic coastline, featuring deserted blue lagoons and stone promontories. 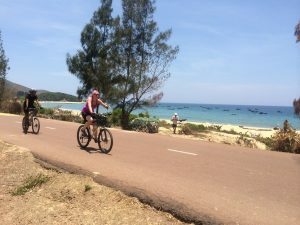 Day 12: NhaTrang – country side cycling ( +- 25 km ). Transfer to airport for flight to Saigon in early morning. Upon arrival driving to Cai Be town . Cai Be which is well-known for its floating market. On arrival in Cai Be, take a motor boat to visit the floating market ( if we are on time ) and watch the locals trading fruit and many other commodities on their vessels. Keep cruising to Vinh Long through a series of small canals to experience the charms of the Upper Mekong Delta. Stop at a Bonsai Gardener’s home for a fabulous lunch including the signature dish of “Deep fried Elephant ear fish”. Enjoy the lunch served in the heart of the garden accompanied by traditional southern Vietnamese folk music. Morning transfer to TanSonNhat Airport for flight home. English speaking local cycling guide. Accommodations as mention on itinerary with 10 nights in 3 star hotels and 2 night in 4 star local hotels around trip as mention by room share (2people /room). Meals as noted B= breakfast, L= lunch, D=dinner. Cold drink as coffee, tea, cola, juice, energy drink for cycling. Sightseeing and activities as noted in the itinerary. 100% ground transportation by 2 mini buses. WHAT NOT International airfare; meals not noted on itinerary; Vietnam visa; insurance other than basic medical ; optional tipping to leader, guides and local staff; excess baggage charges; international airport taxes; cost of medical immunizations; items of a personal nature (alcoholic beverages, laundry, etc. ).